Blooming habit at: Traslasierra - Cordoba, Argentina. Origin and Habitat: Cylindropuntia imbricata is a cactus found in the South-western United States and northern Mexico (Durango, Zacatecas, and San Luis Potosí ), including some cooler regions in comparison to many other cacti. It occurs primarily in the arid regions of the Southwestern United States in the states of Texas, New Mexico, Arizona and Nevada. The species is naturalised in arid regions and along watercourses in South America, South Africa, Mediterranean basin and Australia. Altitude range: It occurs at altitudes from 1,200 to 2,400 metres above sea level. Habitat and ecology: The species is widely distributed and common in the Chihuahua Desert Region in sandy or gravelly areas in the arid plains. Cylindropuntia imbricata occurs in xerophyllous scrub. In parts of its range, often just below the pinyon-juniper belt, it can be abundant, surrounded by low grasses and forbs that are brown most of the year; in such places chollas are conspicuous as the only tall green plant. It sometimes grows at impressively high altitudes in the western part of its range. Cylindropuntias spread via movement of detached segments which are capable of forming roots when they come into contact with the ground. The fruits are also eaten by various wild birds and mammals, including pronghorn, desert bighorn sheep, and deer. The thorny plants provide escape for cover for many small animals. The leafcutter bee Lithurgus apicalis has been observed to pollinate the flowers. There are no major threats to the species and it can tolerate habitat modification. Cylindropuntia imbricata, is a declared noxious weed in New South Wales and also occurs in Queensland, Victoria and South Australia. A biological control program against it commenced in 1925 with the release of the cochineal insect Dactylopius tomentosus. This agent has been found to damage additional species of Cylindropuntia in Australia. Opuntia arborescens Engelm. in Wisliz. Cylindropuntia imbricata var. argentea (M.S.Anthony) Backeb. Description: The cane cholla or tree cholla (Cylindropuntia imbricata) is often conspicuous because of its shrubby or even tree-like size, its silhouette, and its long-lasting yellowish fruits. The above-ground part consists of of a number of succulent, cylindrical segments (joints) about 2-3 cm in diameter. These segments grow mostly end to end and possess areoles which contain glochids (very small, detachable barbed bristles) adjacent to the longer spines. Long spines possess papery detachable sheath. Leaves occur at the base of are-oles and are usually not seen on mature segments as they are shed early. A typical height is about 1 m, but exceptionally it can grow to 4.6 m with a "trunk" diameter of 25 cm. Flowers and fruit form within or near areoles on upper stem segments. Flowers vary through shades or dark pink and purple with a boss of yellow stamens and bright white stigmas, and is said to be a shy bloomer until it reaches 60 cm tall. This plant may live 20 years or more when well pleased with its environment. In addition to the typical species (var. imbricata), two varieties are recognized from West Texas: var. argentea with silvery spines, and var. arborescens, which is taller. Derivation of specific name: Latin verb 'imbricere', to tile a roof. In botanical Latin refers to any regularly overlapping structure, and here refers to the overlapping tubercles of the joints. Imbricated (-stemmed) opuntia. Stems: Branched with a more or less definite cylindrical woody trunk up to 25 cm in diameter. Ultimate segments cylindrical, rope-like or somewhat club shaped, 8-40 cm long and 2 to 3.5(-5) cm in diameter, dark- to grey-green, strongly tuberculate; tubercles 2 to 2.5 cm long, flattened laterally lengthwise. The joints, unlike those of some other chollas, are hard to detach. They are plagiotropic, that is to say, that they grow in a star- or crown-like pattern at all angles to the upright (orthotropic) branches. They will droop in winter but recover quickly in spring. Areoles: Elliptical, subtended by a leaf in the depressions above the tubercles, with yellow to tan wool, ageing to back, containg small bristles (glochids) and spines. Glochids: About 1 mm long that can detach and stick in the skin. Leaves: 8 to 24 mm long, terete. in cross section basally, spreading, straight or curved, very sharp, with the skin separating into a tan paper-like sheath during the first year of development. Flowers: The flowers are bowl-shaped, diurnal, purple or magenta, rarely rose-pink, borne at ends of branches, about 4 to 6 cm long, sometimes 8 to 9 cm broad. Ovary tuberculate, spineless, occasionally bearing a few bristles from some of the upper areoles. Perianth purple. Anthers yellow on purple filaments. Stigma pale yellow. Blooming season: Flowers late spring and summer. Fruits: Naked, egg-shaped with a hollow at the wide end where the flower fell off, green to yellow, 2.5 to 4.4 cm long, 2-4 cm in diameter, strongly tuberculate like the stems or, when long persistent, smooth. Seeds: Pale brown,2.5 to 3.5(-4) mm in diameter. Cylindropuntia imbricata (Haw.) F.M.Knuth in Backeb. & F.M.Knuth: often becomes a tree to 3 m high but has small stem segments. Distribution: its range is wide. Cylindropuntia imbricata var. argentea (M.S.Anthony) Backeb. 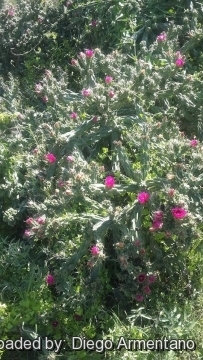 : is only shrubby but has large stem segments with silvery spines. Distribution: Big Bend region of Texas. Notes: The Cylindropuntia (the cylindrical Opuntias of North-America) can easily be distinguished from Austrocylindropuntia (the cylindrical Opuntias of South-America) Austrocylindropuntia by their spines having a papery sheaths (Austrocylindropuntia spines lack them). Moreover Austrocylindropuntia have cylindrical stems that grow indeterminately, while Cylindropuntia has stems that grow in a single season. The seeds are different too. 7) Wikipedia contributors. "Cylindropuntia imbricata." Wikipedia, The Free Encyclopedia. Wikipedia, The Free Encyclopedia, 13 Aug. 2015. Web. 29 Mar. 2016. 12) J. Hosking et al., “Plant Protection Quarterly.” Vol. 3, pages 115–123. 1988. 14) Goettsch, B. “Distribution modelling, macroecology and conservation: cacti of the Chihuahuan Desert Region.” Animal and Plant Sciences, University of Sheffield. 2007. 15) Goettsch, B. and Hernández, H.M. “Beta diversity and similarity among cactus assemblages in the Chihuahuan Desert.” Journal of Arid Environments Latinoamericana y del Caribe de Cactáceas y otras Suculentas 65: 513-528. 2006. 16) Hernández, H.M., Gómez-Hinostrosa, C. and Goettsch, B. “Checklist of Chihuahuan Desert Cactaceae.” Harvard Papers in Botany 9(1): 51-68. 2004. 18) Martínez-Ávalos, J.G. and Jurado, E. “Geographic distribution and conservation of Cactaceae from Tamaulipas Mexico.” Biodiversity and Conservation 14: 2483-2506. 2005. 23) Hernández, H.M., Cházaro, M. & Gómez-Hinostrosa, C. 2013. Cylindropuntia imbricata. The IUCN Red List of Threatened Species 2013: e.T152144A602262. http://dx.doi.org/10.2305/IUCN.UK.2013-1.RLTS.T152144A602262.en. Downloaded on 29 March 2016. 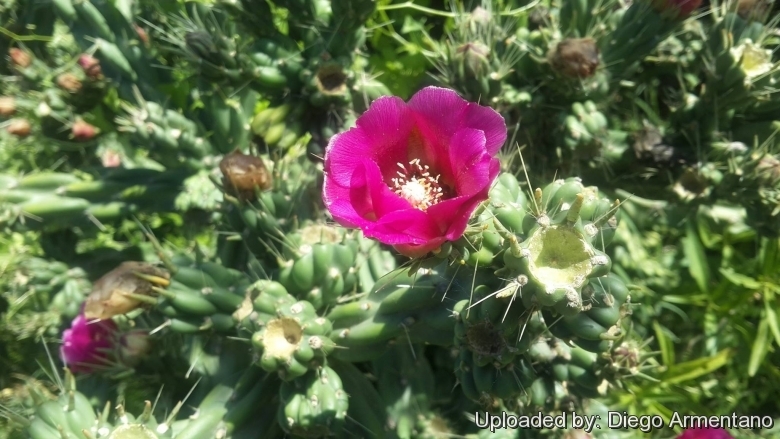 Cultivation and Propagation: Cylindropuntia imbricata is a summer grower cactus that offers no cultivation difficulties. The plants are sometimes grown as ornamentals. Plants may form thickets or be spaced at a few times their width in "gardens". Soil: Use a very a particularly draining substratum, as it is sensitive to rottenness when in presence of humidity and low temperatures and let the soil dry out between waterings, since it's natural habitat is in sandy or gravelly, well draining soils. Repotting: Repot in the spring, when their roots become cramped. Generally, they should be repotted every other year in order to provide fresh soil. After repotting, do not water for a week or more. Water: In summer, during the vegetative period, it must be regularly watered, but allowing the substratum to completely dry up before irrigating again (but do not overwater ); in winter, it’s to be kept dry. Preferable not to water on overcast days, humid days or cold winter days. Hardiness: It is very hardy for a cactus.USDA Zone 5A 8(-20°F or -28°C)). It can handle extremely high temperatures in summer. Exposure: Outside full sun or afternoon shade, inside needs bright light, and some direct sun. Use: It is suitable for “desert” gardens, in association with other xerophytes. Where the open air cultivation is not possible due to the climate, it is to be cultivated in pot in order to shelter it in winter. This species was historically used as a food source by the local people. Traditional uses: Dead stems decay to leave a hollow wooden tube with a pattern of lengthwise slits. These are sometimes used as canes or to make curios. The Roman Catholic Penitentes of New Mexico formerly tied fresh stems to their bare backs in Holy Week processions. The Zuni people use the imbricata variety ceremonially. Warning: It is armed with treacherous spines that are sharp enough to easily penetrate leather gardening gloves. Glochids and spines readily attach to skin and are difficult to remove. (This is one of the most dangerous of all cactus). Handle it with extreme caution, and keep it away from gangways and areas frequented by children and animals. Spines must be meticulously removed with tweezers. Propagation: Stem division. Prickly pear joints root easily and grow rapidly when placed in loose, well-draining soil.